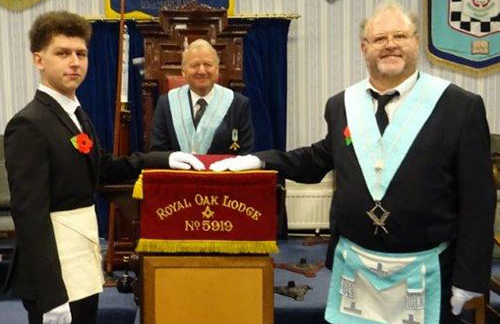 Royal Oak Lodge No 5919 welcomed one of the rarest of candidates in Freemasonry, into its number – a ‘Lewis’ – with the initiation of Royal Oak Lodge member Chris Molyneux’s son, 19 years old Byron Lewis Thomas Molyneux. The lodge was opened by the immediate past master Russell Forsyth who dispatched the early part of the business with some style. Russell then handed over to the director of ceremonies, Alex Tomlinson, in whose capable hands the ceremony of Byron’s initiation was to be conducted. Co-opted into the junior deacon’s role at the last minute was a visitor, Geoff Diggles of Anchorsholme Lodge No 5854 who met Byron at the door of the lodge and conducted him with surety. When he was asked by Alex, ‘if he was of the age of 21 years’, lodge secretary Arnold Flint rose and read the dispensation from Provincial Grand Lodge to allow the initiation of Byron to continue. Acting WM Alex’s first-class delivery of the initiation ceremony could not be faulted, and he conducted the ancient ritual with great sincerity. Steve Hardman was exemplary in his presentation of the working tools of the degree. The ancient charge was delivered in an impeccable and word-perfect manner by the extremely hard-working Geoff. 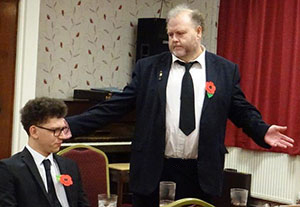 Bryon Molyneux (seated) listening to this father’s passionate toast. Afterwards it was universally agreed that it had been an incredible and memorable ceremony, with the highest standards of ritual, culminating in the delivery of the ‘Address to a Lewis’ being delivered in an emotional and heartfelt manner by Byron’s dad, Chris. At the festive board, as is customary, Byron’s proposer Chris gave an emotional toast to his son and the lodge’s newest brother saying that from an early age he saw that Byron had the Masonic ideals as he was very helpful to others. Bryon has achieved his Gold Scout Award and commenced the Duke of Edinburgh’s award and is presently at Liverpool University, where Byron is studying Biological Science. Byron hopes this will lead to a career in microbiology or genetics. He has also joined the University’s Officer Training Corps which bodes well for his future in life and Masonry. Pictured from left to right, are: Steve Hardman, Geoff Diggles, Russell Forsythe, Byron Molyneux, Chris Molyneux and Alex Tomlinson.